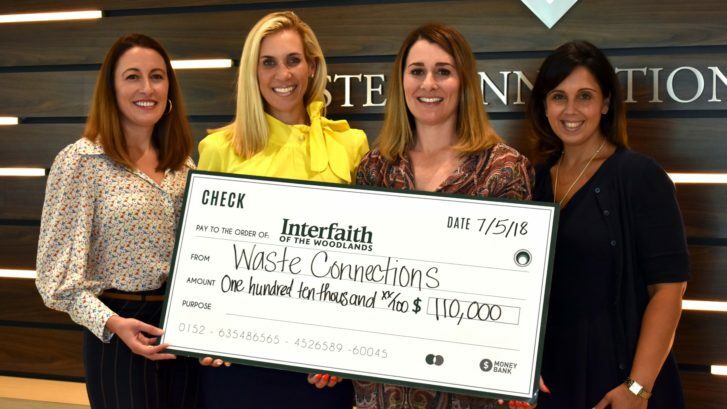 Interfaith of The Woodlands was honored to be among the 10 charities that benefited from the event, which raised a record-breaking one million dollars. Festivities began the evening before the tournament with a reception featuring improvisational speed painter Dan Dunn. The following morning, players and guests arrived to a picture-perfect day. Special guests Roger Clemens, Johnny Damon, Josh Beckett and Bronson Burgon were on hand to visit with attendees. Throughout the 18 holes of golf, players were treated to a variety of contests and refreshments on the course. Even non-golfers were able to get in on the fun with a VIP Experience that included Erin Ness, professional poker player. Waste Connections, Inc. is an integrated solid waste services company that provides waste collection, transfer, disposal and recycling services in mostly exclusive and secondary markets. Waste Connections serves more than two million residential, commercial, industrial, and exploration and production customers from a network of operations in 31 states. The company also provides intermodal services for the movement of cargo and solid waste containers in the Pacific Northwest. Waste Connections, Inc. was founded in September 1997 and is headquartered in The Woodlands, Texas. Interfaith of The Woodlands is a nonprofit social service agency providing numerous programs and services to meet the needs of The Woodlands and the surrounding area. Interfaith provides basic needs assistance and special programs like school supplies assistance and holiday gifts to those experiencing a financial crisis, no matter their socioeconomic level, and supportive service through care and wellness programs to senior adults 62 and over. For more information on Interfaith’s programs and services or to become a volunteer, please visit woodlandsinterfaith.org or call 281-367-1230. 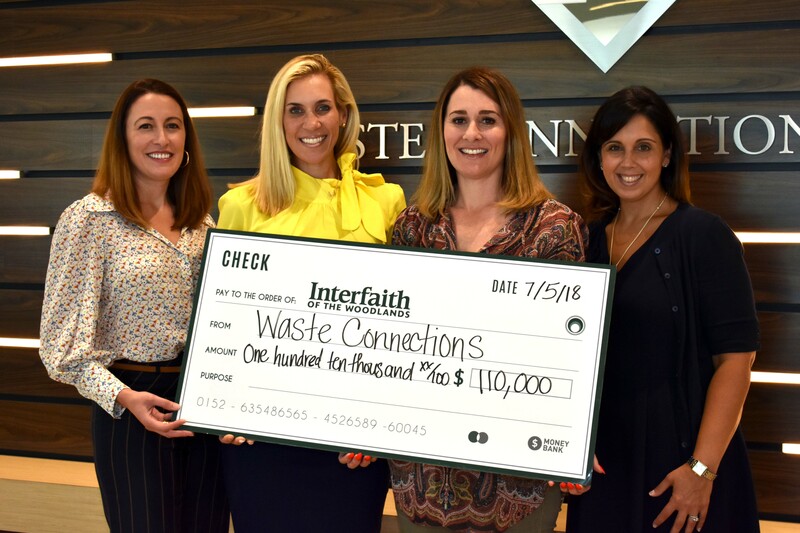 (l-r) Courtney West (Manager of Development at IFTW), Missy Herndon (President and CEO of IFTW), Michelle Little (Waste Connections’ Vice President of Accounting and Golf Tournament Chair), and Carolyn Donovan (Director of Development at IFTW) standing with the $110,000 from Waste Connections, Inc. 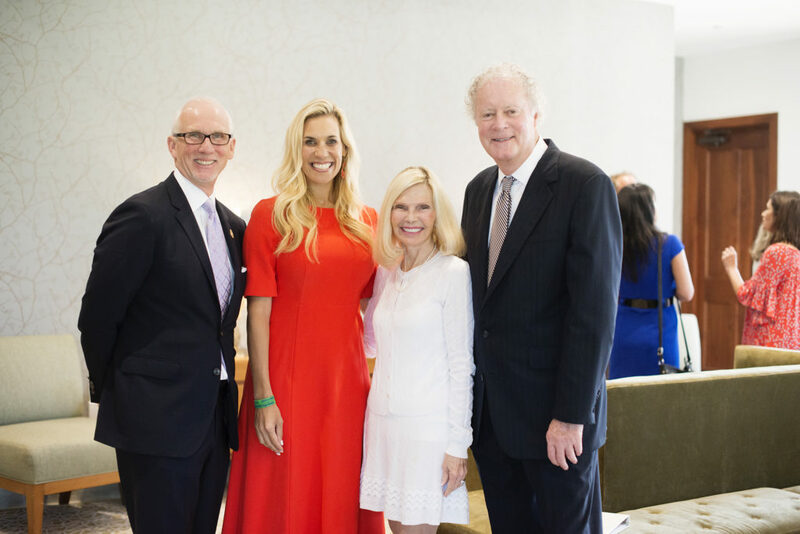 In celebration of 45 years of caring in The Woodlands community, Interfaith selected Mr. Jerry and Dr. Ann Snyder as Honorary Chairs for the 2018 event. The Snyders were chosen on this very special anniversary because of their more than three decades of service to The Woodlands community. Their family values embody the generosity and collaborative spirit The Woodlands was built upon. The Snyders have called The Woodlands home for over 30 years, raising their children in our great community and now their grandchildren as well. “We are honored that Dr. Ann and Jerry Snyder have agreed to serve as the Honorary Co-Chairs for this event. As we celebrate this monumental anniversary of Interfaith of The Woodlands, it was important that our honorary chairs be individuals who believe in the importance of service and community. 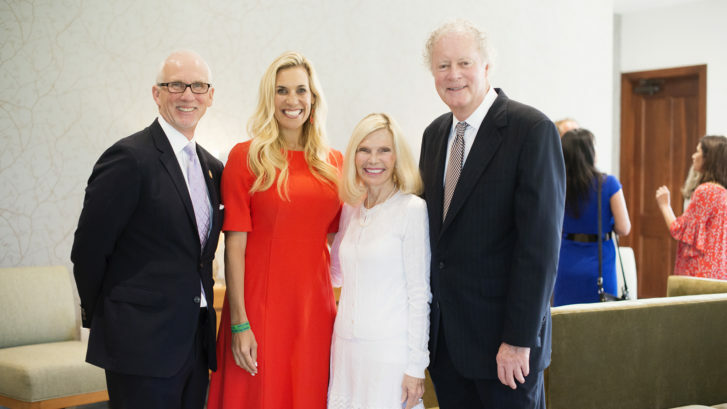 The Snyders are wonderful examples of servant leaders, and we are so grateful for their tremendous hearts that serve Interfaith and The Woodlands community,” said Missy Herndon, President and CEO of Interfaith of The Woodlands. The “45 Years of Caring” themed event, co-chaired by Shirelle Chimenti and Elvira Graham, will feature the honoring of heroes, dinner, live and silent auction items and a one-of-a-kind, Moroccan-themed after party. All proceeds benefit Interfaith of The Woodlands. The 2018 Hometown Heroes will be announced the first week of August. For more information about the gala or event sponsorships, please visit hometownheroesgala.org, contact development@woodlandsinterfaith.org or call 832-615-8230.